The clinical decision support mandate is coming; start planning now. Although the Centers for Medicare & Medicaid Services (CMS) has postponed the implementation date for clinical decision support (CDS) systems, hospitals and imaging centers still need to prepare for it. Instead of the original proposed goal of January 1, 2017, CDS implementation is expected to be mandated by summer 2017, but there has been no definitive statement as of this writing. As set forth in the 2014 Protecting Access to Medicare Act, physicians will need to use CDS software based on appropriate use criteria (AUC) when ordering diagnostic CTs, MRIs, and nuclear medicine studies, including PET. The AUC process has not been postponed. In preparation for CDS, Stephen Herman, MD, founder and CMO of CDS system provider MedCurrent and thoracic radiologist at the University of Toronto, says hospitals and imaging centers should be asking themselves two questions: First, how will CDS change imaging volumes? Second, how will doctors interface with the new system? In answer to the first question, Herman says imaging providers should expect utilization changes. "In places where we've put in CDS, there is a reduction in imaging utilization overall but, importantly, there's a significant shift in utilization, which may affect staff allocation and possibly modality purchasing decisions. For example, the number of CTs may go down, but the number of ultrasounds may go up," Herman says. "The changes that are going to take place at any particular practice are unique, and it's critically important for a practice to get an understanding about what's going to happen at their specific location, whether it's an imaging center or a radiology department in a hospital. Each practice will see something different, depending on the ordering patterns of their doctors." The focus on interfaces is also important, Herman says, because CDS systems need more information than most physicians typically provide when ordering studies. For example, it's common for headache to be listed as the reason for ordering a CT. A CDS system needs more information than that to determine whether an exam is indicated, but different CDS systems collect that information in different ways. "A CDS has to be designed to make it as efficient as possible for the ordering doctors," Herman says. "So what a practice needs to think about, considering that they're competing with other practices in their area, is that it's important for them to have a good CDS user interface. If the system is a real burden to the ordering physicians, they'll go to a neighboring practice that has a better one." Herman says the interface should be as tightly integrated with the ordering physicians' CPOE or EHR systems as possible. Ideally, he says, physicians shouldn't notice when they leave the CPOE or EHR and go to the CDS. Physician training is also important; Herman says a well-designed system shouldn't require a great deal of training, but physicians should know how to use it properly. In addition to ease of use, the system must provide adequate information to the ordering physician. For example, a physician may order an imaging study with and an ACR score of 5, but there may another study with a score of 9. Although the higher score may be enough to sway the physician's decision, Herman says, a brief description explaining the higher score is more likely to convince him or her to switch. Another key is that the system should be scalable with the ability to utilize rules for any specialty. Although radiology is the first specialty to have CDS mandated, CMS plans to eventually expand it to many other specialties. Herman says interoperability will be crucial; to achieve it, radiology must consult with other specialties. "We recommend that they bring other clinicians in. It should not just be a radiology project," Herman says. 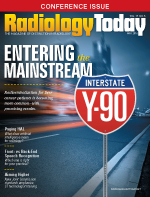 "Radiologists alone cannot determine the best way to move forward because, although the radiology department will benefit from the CDS system, the extra work will be put in by the ordering doctors—radiology's customers. So they need to bring the ordering doctors into the decision-making process." To work out the kinks that come with any new technology, Herman recommends that practices start small. Although it is possible to make a hospitalwide implementation work, a small rollout with a limited group of doctors will allow practices to fine-tune the system and make sure that it's functioning as expected. Herman says this approach also helps to develop local champions of the system, who can then assist with a hospitalwide rollout. Most important, though, is for radiology groups to start thinking about CDS now. "Even though the mandate is delayed and nobody knows how long it is delayed for, people really should look at the impact of bringing in CDS as soon as possible because the mandate is coming," Herman says. "Nobody is saying that it's going away; it's just delayed. The sooner an organization understands the impact of CDS on its own practice, the better, because there will be some long-term planning that needs to take place."